I loved these juices. They arrived from Fort Pierce, Florida to my office in Hollywood, CA in a refrigerated styrofoam pack. Defying time and distance, the first gulp I took of their orange juice tasted as if I were driving through Florida and stopped at a fresh-squeezed juice stand beside an orchard. Of the juices that I tried, I liked their all natural orange juice the best. The fresh-squeezed taste was undeniable and it was pleasantly sweet. I couldn't believe so much sweetness could exist without a little sugar, but the label listed the ingredients short and sweet: 100% orange juice. My second favorite was the their all natural grapefruit juice which had me appreciating the difference between this fresh-squeezed variety and some of the watered-down varieties you get at the grocery store. People who don't care for grapefruit juice because of it's tartness should give this brand a try. The tartness in this juice is more of a subtle note than an overriding flavor. 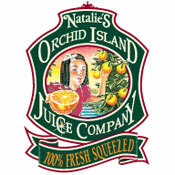 Taking third place in my tour of Natalie's Orchid Island juices was all natural tangerine juice. If you've never really appreciated the difference between tangerines and oranges, you should give this one a try. Coming in last place was their organic orange juice which, despite having the title that would indicate the most freshness, tasted the most like ordinary grocery store orange juice from concentrate. Truly fresh-tasting juices are a great thing to wake up to. Orchid Island obviously understands what makes some juices better than others. These were among the best tasting juices I've ever tried. 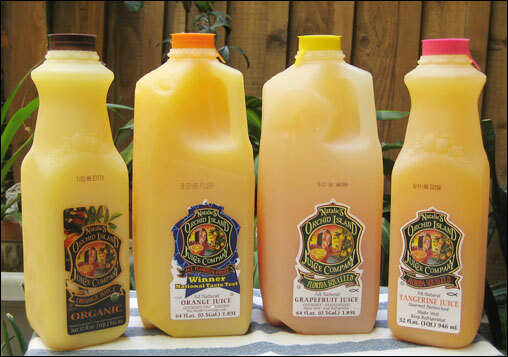 Orchid Island Juice Company personally selects and tests only the finest Florida fruit which is picked and squeezed to capture the raw flavor of the juice at its peak. Only Florida fruit is used ALL YEAR in our 100% Fresh Squeezed Juice. Our commitment to you is that we produce juice only when you place an order. This guarantees product freshness. Orchid Island Juice Company "delicately" pasteurizes our juices at the lowest possible temperature for the shortest time to retain the fresh taste enzymatic activity and the nutritional value of fresh juice. Visit Orchid Island Juice Company online at orchidislandjuice.com. 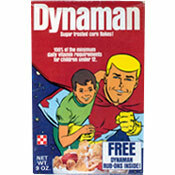 The $0.0 price below is due to the fact that company sent the juice for sampling purposes at no cost to MrBreakfast.com. What do you think of Natalie's Orchid Island Juices? No doubt in my mind that they produce the best tasting Grapefruit juice and Orange juice available. I noticed on their website that they now are offering Tomato juice, but I have not been able to find it in the stores. Orchid Island is the best. You get what you pay for. I always ask where the OJ is from. If it is not from Florida, I will not drink it. Then, if it is not fresh, I will not drink it. There is not any brand that is even in the same galaxy as Natalie's. I love all of Natalie's products. It's more expensive than Minute Maid and those kinds, but it's worth it... so much fresher with better flavor. The Best Orange Juice Period. Nothing tastes like it and I have tried them all. Hands down best orange juice on the market. Haven't seen them here in Portland, OR. I'd like to try... can you suggest a store? This juice is exactly as Mr. Breakfast described it. So fresh it tastes and smells like you are in an orange grove. Highly recommend this to everyone!